It feels like Český Krumlov is not real. Seriously, everything is so beautiful and so old that I had the feeling I’ve traveled in time. Český Krumlov is the ultimate tourist destination in the Czech Republic. After Prague, it’s definitely the most picturesque and stunning town in the country. 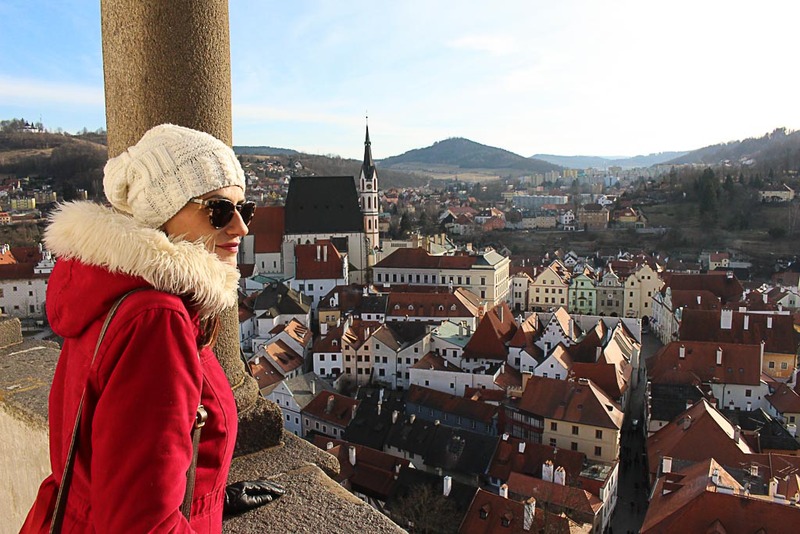 I was astonished by the beautiful architecture and all the things to do in Český Krumlov. Its history and places to visit will keep you busy for one or two days. Most of the travelers visit Český Krumlov as a day trip from Prague. It’s a nice way to explore the city, but there are so many things to do in Český Krumlov, places to visit and beers to drink that we decided to stay 2 days and 3 nights. That way we had the chance visit Český Krumlov and also go on a day trip to Lipno, another cute town with stunning nature. The huge castle, the cobblestone alleys, and the medieval houses made Český Krumlov a Unesco Heritage Site. It’s a place like no other, once you step in the old town you are transported to the past. One day in Český Krumlov might be enough to walk around the city and visit a few attractions. However, I highly recommend you to stay a bit longer, at least two days. 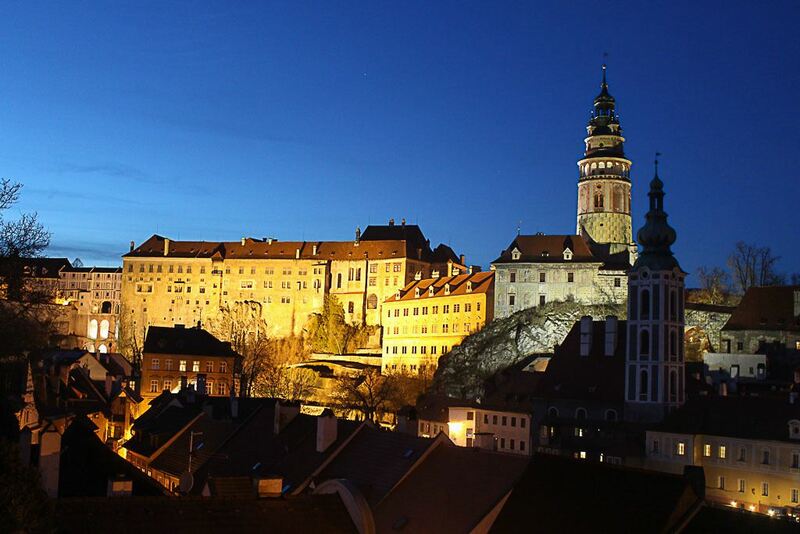 So you can experience all the best things to do in Český Krumlov and see the city at night time. When all the tourists leave the town you can really enjoy the romantic and medieval Český Krumlov. The city is an open air museum, and it’s so tiny and so cute that in a few hours you can see it. 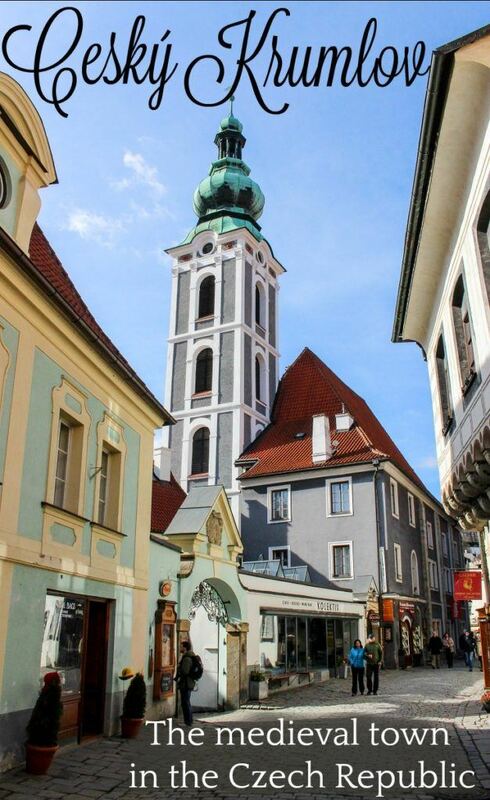 Explore the streets that lead to the St. Vitus, a neo-gothic church that stands out in the middle of the town. Walk by the Vltava River [the same river runs through Prague], and get lost in the tiny alleys full of charming restaurants and hotels. We love to walk around and explore the city, but also we wanted to understand more about Český Krumlov history and how the city is so old and so preserved. To answer all our questions we booked a guided walking tour at the Český Krumlov Tourism Center, and it was the wisest move ever. Our guide took us to some incredible viewpoints, explained about how Český Krumlov remained unknown for some many years, and how it was restored to its stunning perfection. It’s a great story to listen, that brings all the medieval and renaissance architecture alive. At the Český Krumlov Tourism Center we also bought the Český Krumlov Card, a ticket that gives you access to 5 museums, including the castle. This is a money save option and also will help you to avoid queues. The price of the ticket was 300 CZK [12 usd] per adult, if you are traveling with your family they also have a family ticket, 2 adults and 3 kids for 600 CZK. With the card in hands, you are ready to explore the city and things to do in Český Krumlov. After the walking tour, take some time to visit the important attractions in Český Krumlov as the Český Krumlov Regional Museum, Egon Schiele Art Centrum, Museum Fotoatelier Seidel and the Medieval Minority Monastery. 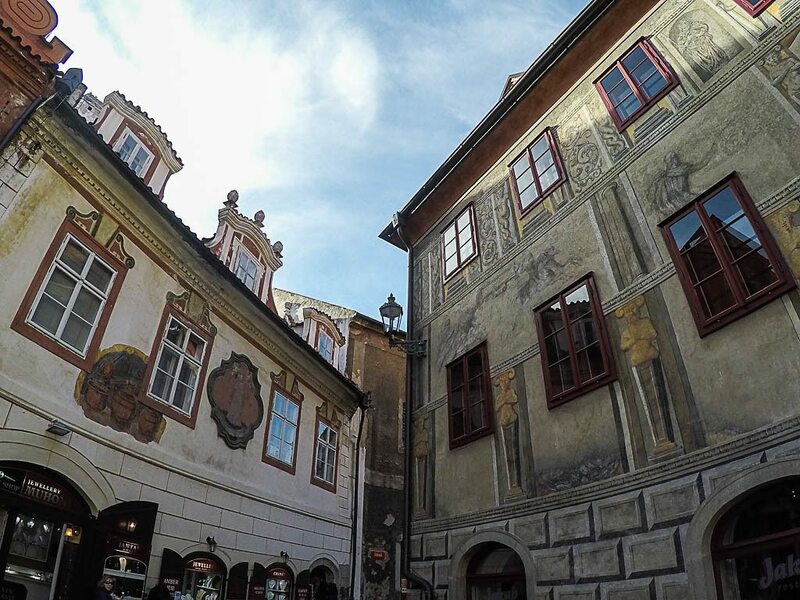 There are other museums and historical buildings to see in Český Krumlov, but if you are in the town for only one or two days, those are the highlights you can’t miss. 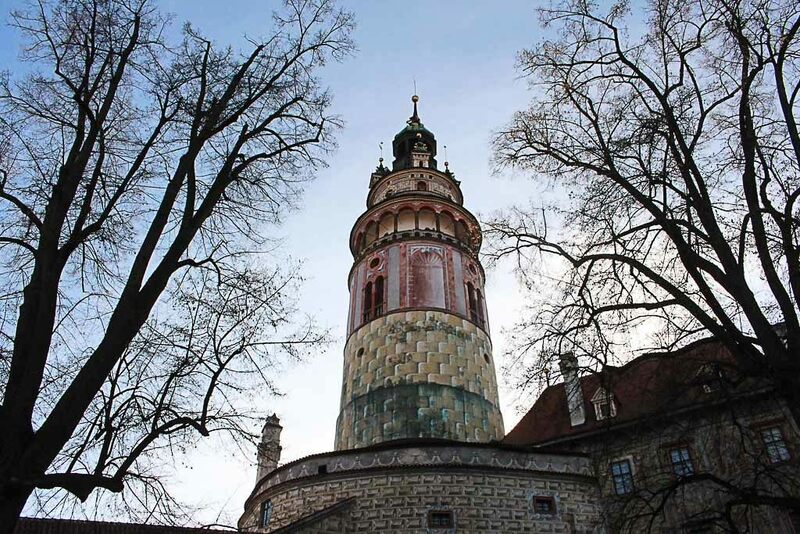 You can’t say you have visited Český Krumlov without going to Český Krumlov Castle and Tower. Built from the 14th to the 19th centuries, Český Krumlov Castle is one of the biggest castles in the Czech Republic and in Europe. At the Český Krumlov Castle you can admire the buildings and gardens from outside, or you can explore the interior and even go on guided tour to understand the history of the complex. The castle is huge, and you can have access to different areas as the rooms, the stables, cellar, and museum. There is also a bear there, that’s true! One more story you must discover while visiting the castle. One of the top attractions in Český Krumlov is the Castle Tower, and even if you are afraid of heights you must climb it. The tower is open to the public daily from 9 AM to 4 PM [the time changes according to the season, check the Český Krumlov Castle website for details]. The good news is that the entrance to Český Krumlov Tower and Castle Museum is included in the Český Krumlov Card, so you don’t need to buy any extra ticket to visit these two attractions. The view from the tower is stunning, my suggestion is to go up at the end of the afternoon so you can see the city and admire the sunset. We were in Český Krumlov in winter [last week of February], the weather was cold, but we had sunny days what made the city look even more beautiful. Inside the Český Krumlov Castle you can visit one of oldest and best preserved Baroque Theatre in the world. All the carpentry, painting and murals were done by Viennese artists. Inside the theater are original pieces and information from the theater’s life from the 17th to 19th century. Everybody knows that the Czech Republic is the country of good beer. In Český Krumlov it started in 1560. The best part is that you can taste the beer and visit the original brewery that it’s not only famous in the South Bohemia, but worldwide. You can go to the traditional Pivovar Eggenberg for beers, for a meal or for a beer tour and taste the local beer that has been produced in the same place for centuries. This is one of the top things to do in Český Krumlov that you won’t find in any guide book. 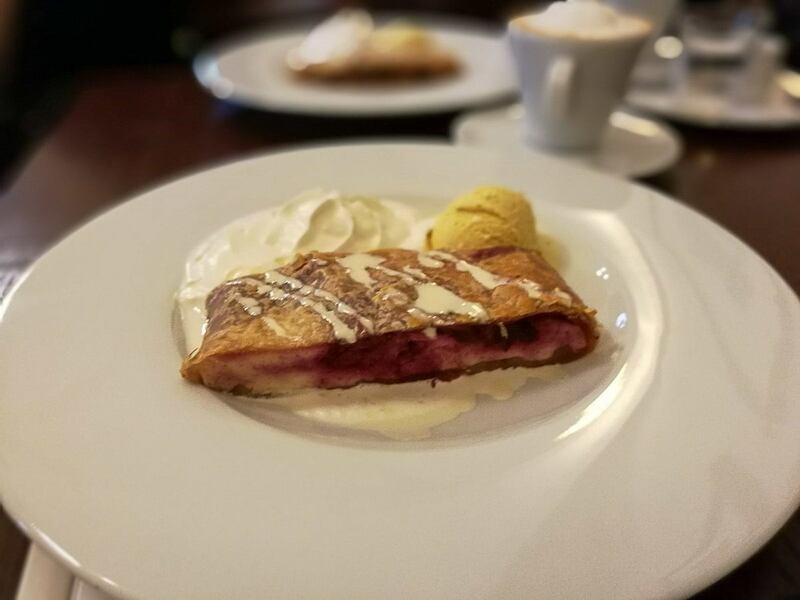 This is our personal recommendation for the best strudel in the Czech Republic, and I would dare to say in Central Europe. Seriously, you must stop at Café Štrúdl and try one, two or even three of their pastries, they are gorgeous. This tiny cafe is tucked away from the busy square and it’s the perfect spot for an afternoon snack. Here is the food and beverage menu, and as it is a small tea room, you might need to wait for a table. But don’t worry you will be reward with mouthwatering flavors. 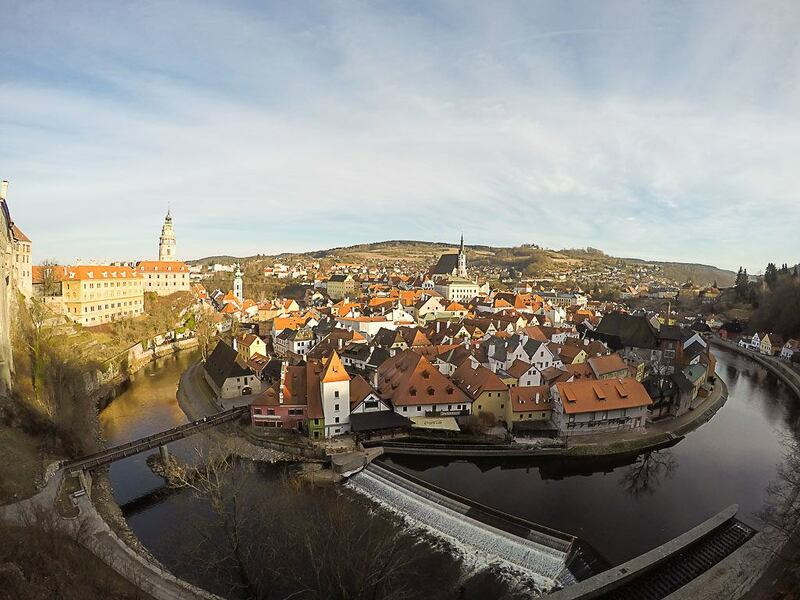 Here is another cool thing to do in Český Krumlov that not many people know about. 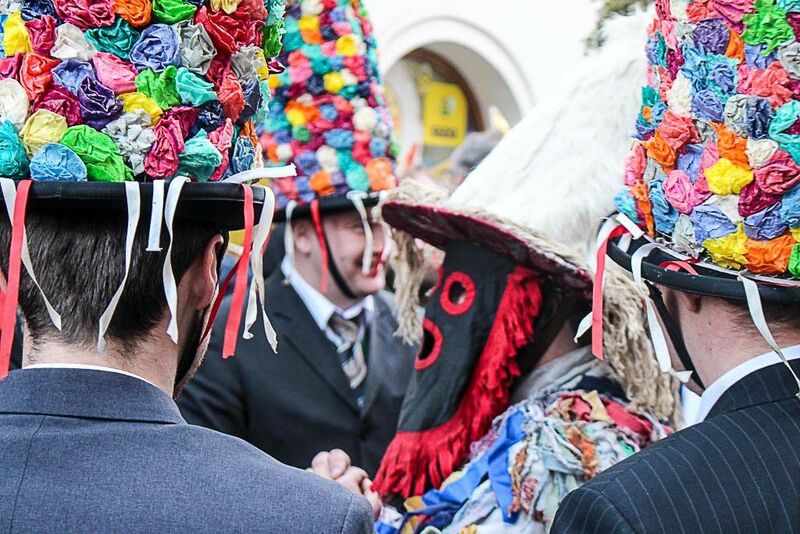 We were lucky enough to be in Český Krumlov during the Carnival Festival [this year it was on February 25th to 28th]. The medieval town was the address of masquerade parades, music and fun. 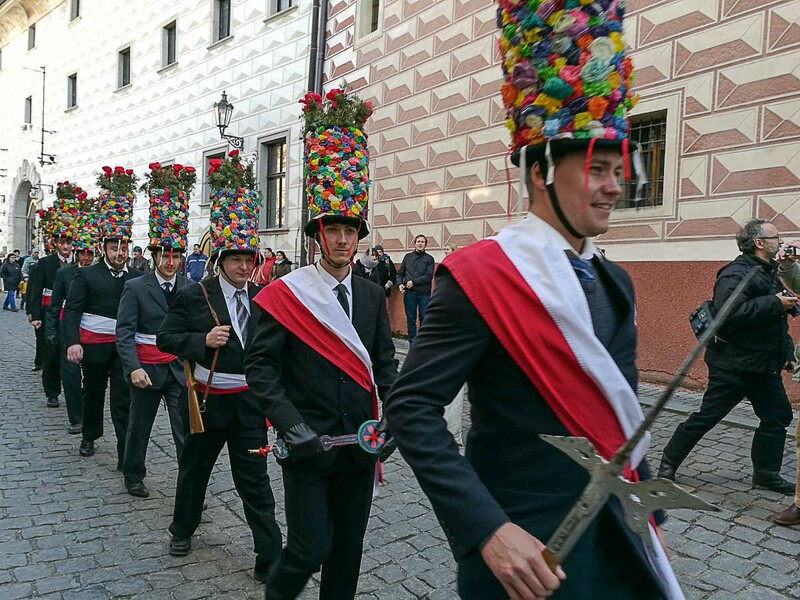 There were many events happening in Český Krumlov during the Carnival as royal banquets, parades, and party at the local brewery. For us, Brazilians who celebrate Carnival like no other nation, it was very interesting to be part of the festival. To witness the street parade, full of families, kids, and curious tourists. Definitely one of the best things to do in Český Krumlov, especially in winter time. If you are planning your itinerary to Český Krumlov, what to do and attractions to visit, keep in mind that the Carnival always happens a few days before the Ash Wednesday, the Catholic holiday. If you decide to stay longer in town, you can also go on a day trip from Český Krumlov. We did that, we spent a day and two nights in the old town and one day at Lipno nad Vltavou. This village belongs to Český Krumlov District and it’s only 30 minutes away from the old town. The top attractions in Lipno are completely different from the things to do in Český Krumlov. This tiny village is famous for the beautiful lake, ski resort, and the Lipno Treetop Walkway. 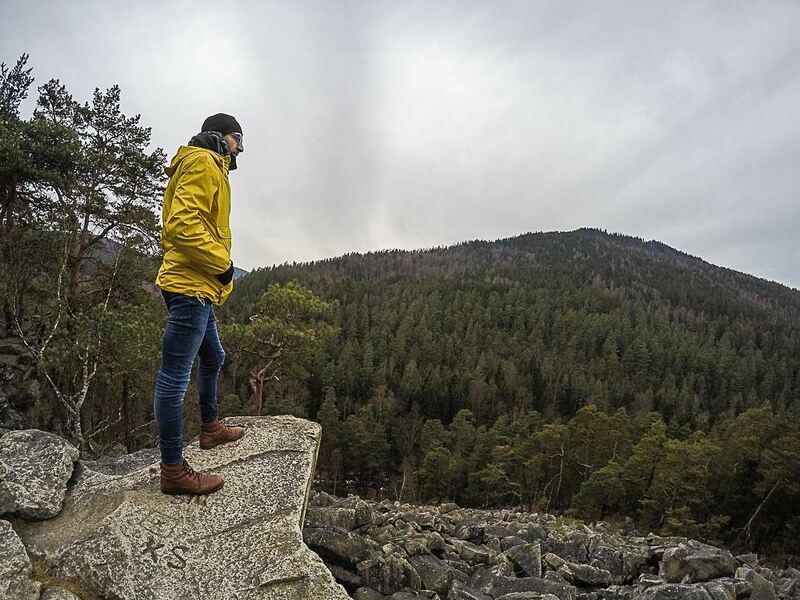 Summer or winter, there are tons of things to do in Lipno, most of them connected to nature. We booked a taxi via our hotel and the driver took us all the way from Český Krumlov to Lipno and picked us up at the end of the day. We paid a total of 1600 CZK [69 usd]. You can book a taxi privately or go on a day tour to Lipno, it’s your call. You can book a guided tour at the Český Krumlov Tourist Information Center in the main square. 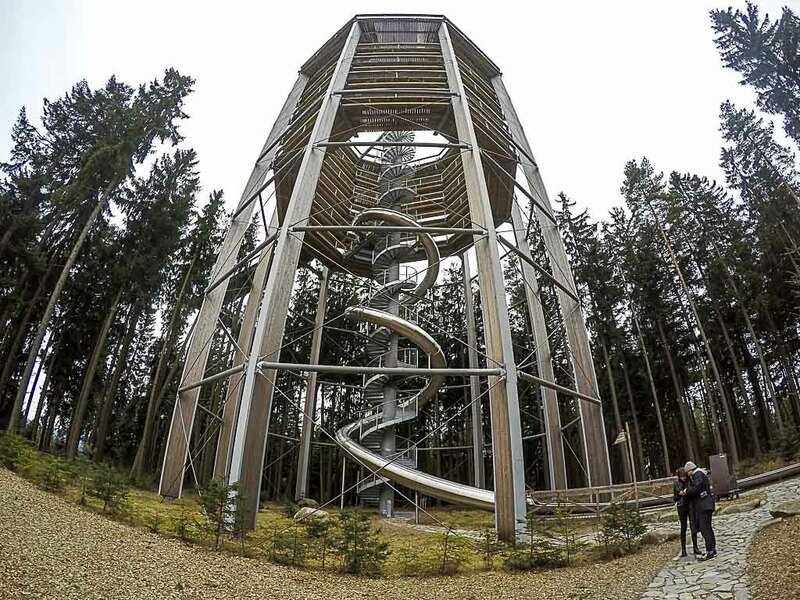 This is a unique and stunning attraction in Lipno. A barrier-free wooden pathway that leads you from the ground level to a 24 meters high platform. From there you can climb to the top of a 40 meters high tower. It sounds like a hard walk, but it’s not. The Lipno Treetop Walkway is a pleasant walk to the top of the forest. You will be surrounded by the trees and witness one of the most beautiful landscapes in the Czech Republic: the Šumava Mountains and the Lipno Reservoir. 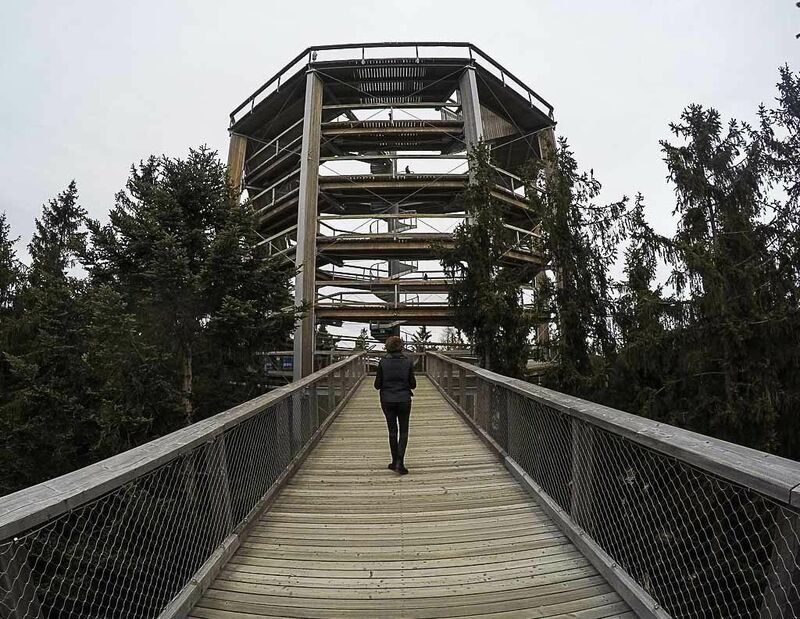 The Treetop Walkaway, or Stezka Korunami Stromu in Czech, was built in 2012 and it’s open all year round. It’s the perfect attraction for anyone that likes to be in the middle of nature and it’s is also accessible for wheelchair. To make the experience a bit more adventurous, you can go down from the top of the walkway sliding on a toboggan. It’s the perfect end, a bit of adrenaline after a walk in the sky. Depending on the season the opening hours of the Treetop Walkway changes, so check the official website before planning your visit. I love snowboarding, when I heard about a day tour to Lipno for skiing my eyes were shining. 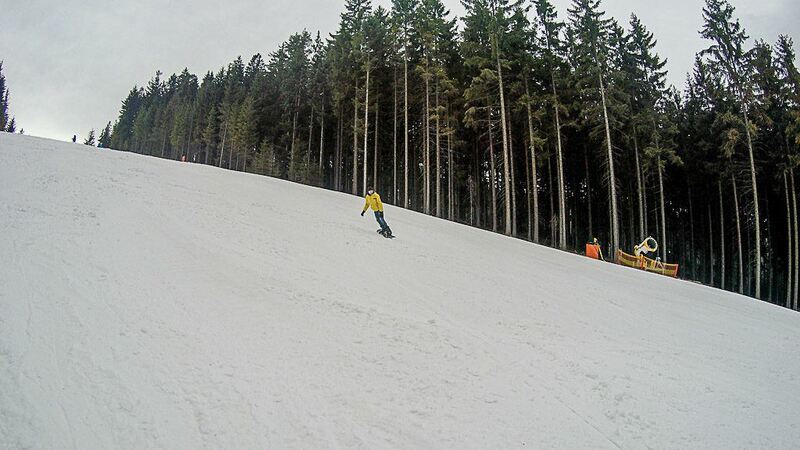 Lipno Ski Resort has awesome facilities for beginners and intermediate skiers and snowboarders. I would say it’s a perfect place for families and those who want to learn skiing or snowboarding. The resort has about 11km of pistes, over 60% are easy ones and 34% are intermediary slopes. I’ve spent one afternoon riding all pistes including the ski cross and loved the place. It was a busy day with competitions and full of Dutch families [Lipno Ski Resort is famous in The Netherlands], although there wasn’t much queue for the ski lifts. Ski schools and rental shops are located at the bottom of the slopes, easy to spot and get your gear ready. The season usually starts in early December and ends around March/April. Night skiing is available so you can visit Český Krumlov during daytime and travel to Lipno at the end of the day. Big thanks to Vojen for guiding me through the resort and the snowboarding tips! The Lipno Reservoir or Lipno Lake is surrounded by nice hotels, resorts, and restaurants. You can enjoy the views while sipping a coffee or relaxing at one of the wellness centers. If you read our post about Liberec, another winter sports town in the Czech Republic, you already know that I’m not good with snow sports. So, while Rob was doing snowboard, I was at the Amenity Resort Wellness Center doing some stretches, enjoying the sauna and the pool. The Lipno Lake is also a great place to visit during summer time. There you can rent boats, kayak, and swim. When the snow melts, the Lipno lake and mountains are the perfect places for mountain bike, hiking and water sports. The Šumava Mountains is a paradise for hiking. As we were there for only one day we venture ourselves on a small hiking to a rocky point by the Vltava River, before the dam. It was a quick ride from the Lipno Ski Resort and there we could see the mountains, the trees and the river that cross the country and goes all the way to Prague, passing by the charming Český Krumlov. This is not a tourist spot, we found it because of a local friend we met in Lipno Ski Resort. He knows everything about Šumava Mountains, Lipno, ski and outdoor sports. To find this and other amazing places in the area follow Vojen’s Instagram. To visit Lipno and all the attractions in Český Krumlov you will need to stay more than one day in town. There are over 200 hotels in Český Krumlov and to chose your Český Krumlov accommodation might be a daunting task. So here is our suggestion on where to stay in Český Krumlov, accommodation, and hotels for every budget and taste. If you are looking for one of the best hotels in Český Krumlov look no further. The Hotel Bellevue Český Krumlov is a stunning property where a helpful and smiling staff will be ready to welcome you. The Hotel Bellevue Český Krumlov is located a few meters from the castle, the Pivovar Eggenberg brewery, and the monastery. 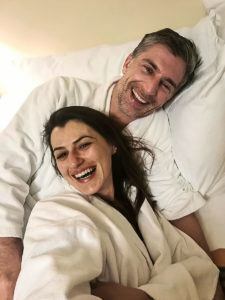 We stayed 2 nights in the Junior Suite, the room is huge, about 40m2 with a comfy king bed, a bathtub to relax after walking around the city and a Nespresso machine to kick off the day. 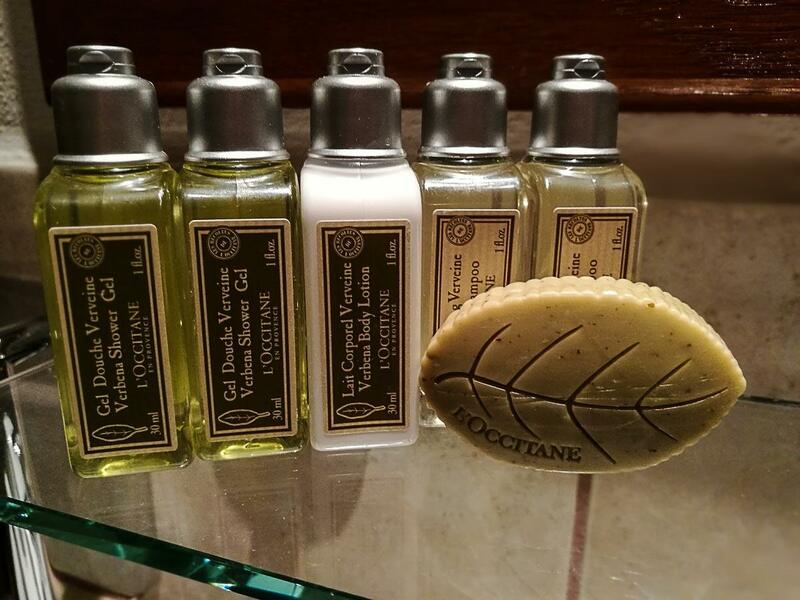 Natalie absolutely loved the L’Occitane toiletries. The breakfast is a feast of local cheeses and cold cuts. Our recommendation is to book your room in advance since there are only 3 Junior Suites. Although you can choose between 62 other rooms and 1 Presidential Suite. For those searching for budget accommodation in Český Krumlov, the Krumlov House is a good option. It’s located about 250 meters from the bus station and 800 meters from Český Krumlov old town. The property offers dorm and private rooms. Please, note that we didn’t stay there, we saw the hostel while walking around the city and we read great reviews naming Krumlov House as one of the best hostels in Český Krumlov. Book your room at Krumlov House now! If you are still in doubt about where to stay in Český Krumlov, search for the best hotel or hostel at Agoda.com and Booking.com. Český Krumlov is located in South Bohemia region and it’s two hours drive from Prague. Doesn’t matter if you are planning to stay a week or only going on a day trip from Prague to Český Krumlov, you can do it by train or by bus. We travel by train from Prague to Český Krumlov, with a change at České Budějovice. For us, this was the best option as we were traveling with Eurail Pass through the whole Central Europe. If you want to explore the Czech Republic by train read our comprehensive guide about how to travel with Eurail Pass. 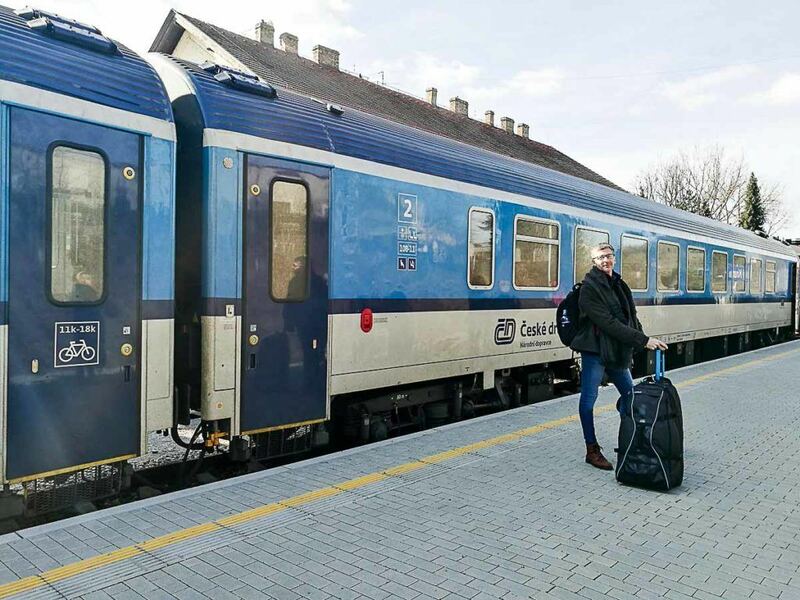 If you are only doing this train trip, then you can buy the single ticket from Prague to Český Krumlov [during our trip the price for the train ticket was from 7 to 10 Euros each way]. There are several trains daily, most of them with one change at České Budějovice and it’s a 3h30min train ride. The best train from Prague to Český Krumlov is the one that departures at 8 AM, it’s a direct train and the trip takes only 2h40min. It’s worth to wake up early, especially if you are only doing a day trip to Český Krumlov. To go back to Prague, the last train departures from Český Krumlov at 6:50 PM, and there is no direct train on the way back. You can check the timetable and price at the Czech Train Service website. The RegioJet Company offers buses from Prague to Český Krumlov every hour, from 6 AM to 9 PM. The return bus runs from 5 AM to 8 PM, and the ticket costs from 7 to 10 Euros each way. The bus from Prague to Český Krumlov takes up to 3 hours, depending on the traffic. There is no much difference between bus or train from Prague to Český Krumlov. The best option will be the one that fits on your travel itinerary and on what type of experience you want to have. We are big fans of train trips, and the landscape you can see on the way from Prague to Český Krumlov is stunning, worth the ride. From the train or bus station in Český Krumlov, you can take a taxi to the old town or to your hotel. Just keep in mind that to enjoy a day trip from Prague to Český Krumlov you will need to wake up early, so you will have time enough to visit the top attractions in Český Krumlov. Or instead of rushing around, plan to stay at least one night and experience all the cool things to do in Český Krumlov, what includes a nice dinner and beers. Enjoy the best things to do in Český Krumlov and have fun in the beautiful Czech Republic. Tks for the info Vaclav! I’d be exploring this magical place by foot Natalie and Robson. Whether cruising thru town or heading up to the woods, being on foot helps me not miss all the little details that make this place stand out, or that make any place stand out. Great job guys! Totally Agree with you Ryan! Nothing better than going for a walk and getting lost in a new city, this is the best way to truly discover a place. 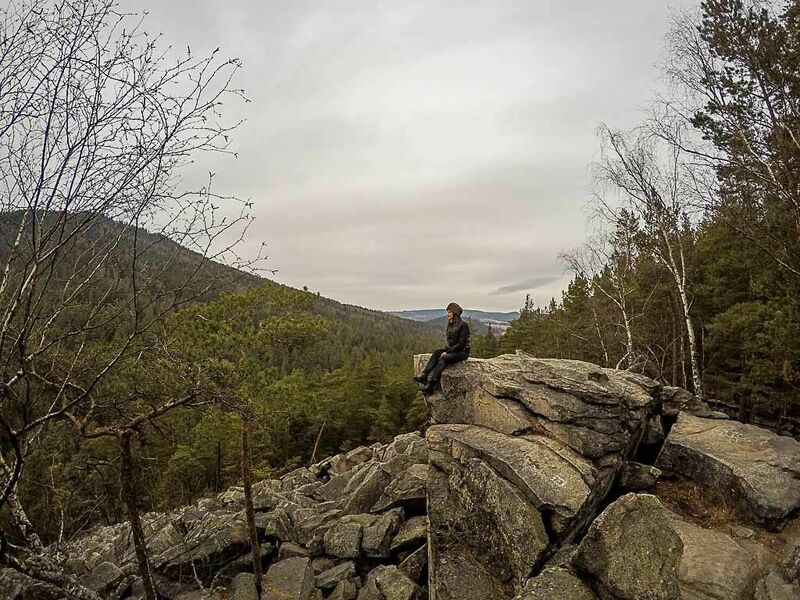 Good idea to go to to Sumava mountains – near the Lipno you can visit Vitkuv Hradek, way there is very interesting, namely during the wintertime. Especially in Lipno I may recommend you one newly opened hotel Leyla – In case you are into oriental cuisine, they’ve got good Azerbaijani cuisine. 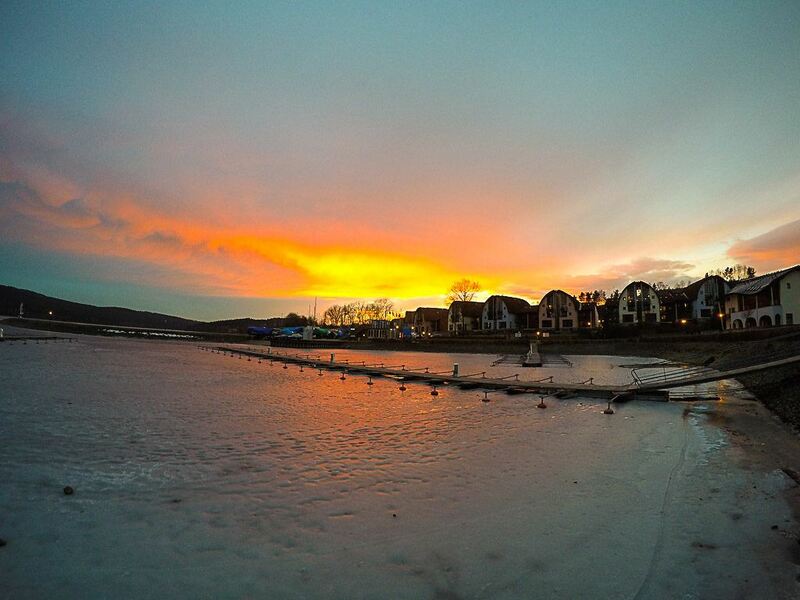 Lipno is a great place! Go for it!